According to Rightmove, during the last year, sold prices in Newton Mearns were 10% up compared with the previous year. As usual, we are dealing with a busy market with lots of competition amongst buyers to secure their dream home. In our roundup this month, we provide you with a selection of the latest properties in our books. An imposing detached villa located within sought after Higher Whitecraigs, occupying a prominent corner position on Lethington Road and Craignethan Road, with aspects towards Whitecraigs Golf Club. Dalnagairn is a substantial and distinctive traditional detached villa, which has been extended, re-furbished and re-designed by the present owners, set within generous and private garden grounds. In total the accommodation extends to over 4000 Sqft and provides flexible accommodation, well designed for family living. Fairwinds is an elegant and locally admired five bedroom detached villa, occupying a slightly elevated position on Davieland Road, opposite Rouken Glen Park, commanding fine views towards the boating pond and boat house. A substantial family home, which has been comprehensively refurbished and re-designed by the present owners, while retaining much of its original character and charm, affording well appointed accommodation arranged over three floors. In total the accommodation extends to over 3000 Sqft and provides flexible accommodation, well designed for family living. Fairwinds is principally built of harled brick with distinctive stone relief under a pitched tiled roof. A substantial modern five bedroom detached villa positioned within sought after Greenwood Manor. The Culross is a detached executive home which offers the scale and size of a more traditional home yet affords all the benefits of a modern build and extends to over 2,360SqFt, affording well appointed and flexible accommodation, carefully maintained by the current owners, well designed for family living. A beautifully presented five bedroom detached villa positioned within sought after Greenwood Manor development. The ‘Braemar’ house type is a detached executive home which extends to approximately 2,972 SqFt, affording well appointed and flexible accommodation over three levels, carefully maintained by the current owners, well designed for family living. The Pollock – Three bedroom ground floor apartment. 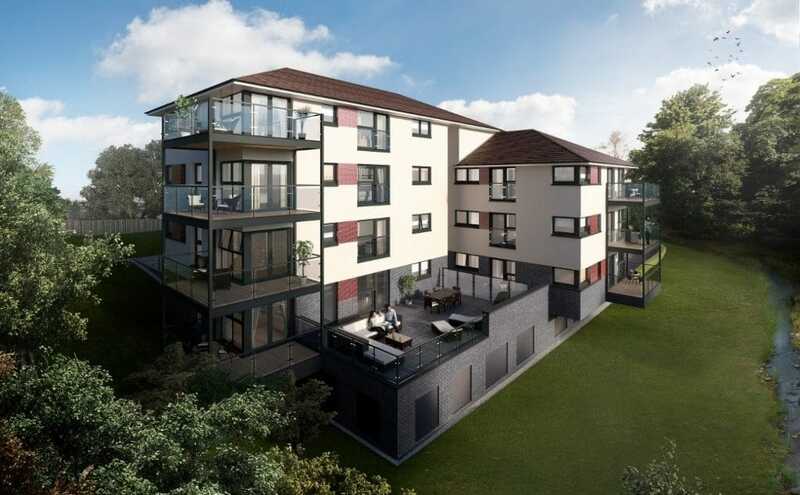 A spacious three bedroom ground floor apartment situated within this exclusive and private residential development by award winning Westpoint Homes, located within the heart of the desirable Broom Estate, residential enclave of Newton Mearns. Anticipated completion date is September / October 2016. A rare opportunity to acquire this beautifully presented two bedroom ground floor apartment within the private and exclusive Sandringham Court development with 2 allocated parking spaces and private lock up garage. Sandringham Court is one of Glasgow’s last remaining lavish Art Deco buildings, sympathetically restored to its former glory, located within the heart of the desirable Broom Estate residential enclave of Newton Mearns, set within well kept extensive landscaped resident’s gardens. A well presented five bedroom detached villa, situated in lovely south facing private gardens, well placed for local amenities and services in leafy and quiet cul de sac setting. A substantial architect designed family home, privately commissioned in 1982 and set within generous broad fronted corner plot, affording well appointed and light accommodation arranged over two levels. In total the accommodation extends to over 2500 Sqft and provides flexible accommodation, well designed for family living. Many apartments are south facing and enjoy an abundance of natural light. A beautifully presented detached bungalow, located within sought after small cul-de-sac location, set within well kept garden grounds. The property has been well maintained by the present owner and affords accommodation all on the one level.